The following text applies to any material that appeared in any IEEE Transaction or Elsevier Journal. "Personal use of this material is permitted. However, permission to reprint/republish this material for advertising or promotional purposes or for creating new collective works for resale or redistribution to servers or lists, or to reuse any copyrighted components of this work in other works must be obtained from IEEE or Elsevier publishers". D. Bouchaffra, “Fusion of Deep Learning and Geometric HMMs for Age-Invariant Face Recognition”, submitted to IEEE TNNLS, 2018. D. Bouchaffra and N. Zerrouki, “Geometric Hidden Markov Models: Application to Land Cover Change Detection”, submitted to Remote Sensiong of Environment, 2018. Djamel Bouchaffra (Lead Editor), Mohamed Cheriet, Diane Beck and Marc Jodoin, Special Issue titled: "Machine Learning and Pattern Recognition Models for Change Detection", in: Pattern Recognition (Elsevier), Volume 48, Issue 3, 2014. D. Bouchaffra, "Mapping Dynamic Bayesian Networks to Alpha-Shapes: Application to Human Faces Identification across Ages", in: IEEE Transactions On Neural Networks and Learning Systems (TNNLS), Volume 23, Issue 8, pp. 1229-1241, 2012. (PDF). D. Bouchaffra, "Conformation-based Hidden Markov Models: Application to Human Face Identification", in: IEEE Transactions On Neural Networks (TNN), vol. 21, no. 4, pp. 597-608, 2010. (PDF). D. Bouchaffra, "Application of Topological Hidden Markov Models to Protein Fold Recognition", IEEE/ACM Transactions On Computational Biology and Bioinformatics. 2016. D. Bouchaffra, "Embedding HMM-based Models in a Euclidean Space: The Topological Hidden Markov Models", in: Pattern Recognition (Elsevier), Volume 43, Issue 7, July 2010, Pages 2590-2607. (PDF). D. Bouchaffra and A. Amira, "Structural Hidden Markov Models for Biometrics: Fusion of Face and Fingerprint", in: Special Issue of Pattern Recognition (Elsevier), Vol. 41/3 pp 852-867, 2008. (Among the Top 25 Hottest Articles of the PR Journal) (PDF). D. Bouchaffra, "Introduction of Logic in Language Modelling: The Minimum Perplexity Criterion", in: The International Journal of Robotics and Automation, Volume 20, Issue 3, 2005, Publisher ACTA Press. D. Bouchaffra and J. Tan, "Structural Hidden Markov Model and Its Application in Automotive Industry", Enterprise Information Systems V, Camp, O.; Filipe, J.B.; Hammoudi, S.; Piattini, M.G. (Eds. ), XIV, 332 p., Hardcover, ISBN: 1-4020-1726-X, Published by Springer, 2004. D. Bouchaffra and J. Rouault, "Capturing Observation in a Nonstationary Hidden Markov Model" , Selected papers in "Models Selection from Data: Artificial Intelligence and Statistics IV", in: Lecture notes in Statistics, Vol. 89, edit. P. Cheeseman & R. Oldford, published by Springer-Verlag, 1994. D. Bouchaffra, "Consistent Regions in Probabilistic Logic when using Different Norms", Complete Version, in: Selected papers in Artificial Intelligence Frontiers in Statistics: AI and Statistics III, edit. David .J. Hand, published by Chapman and Hall London, pp 370-386, 1993. D. Bouchaffra, "A Relation between Isometries and the Relative Consistency Concept in Probabilistic Logic", Selected papers in "AI, Expert Systems and Symbolic Computing for Scientific Computation", edit. J. Rice and E. N. Houstis, published by Elsevier North-Holland, 1992. D. Bouchaffra and J. Rouault, "A Nonstationary Hidden Markov Model with a Hard Capture of Observations: Application to the Problem of Morphological Ambiguities", in "Probabilistic approaches to Natural Language", Papers from the 1992 Fall Symposium, Technical report FS-92-04, AAAI Press, American Association for Artificial Intelligence, 1993. D. Bouchaffra, F. Ykhlef and A. Allam, "Core Rock Caracterization using Digital Imaging (CT-Scan) and Machine Learning Models", 11èmes Journées Scientifiques et Techniques (JST11): Innovation Et Partenariat, Dans un Contexte Mondial de Transition Energétique, 16 - 19 April, 16-19, 2018 Oran, Algeria (best paper award). H. Ykhlef and D. Bouchaffra, “Induced Subgraph Game for Ensemble Selection”, (Oral Presentation) in Proceedings of the 27th International Conference on Tools with Artificial Intelligence, November 9-11, 2015, Vietri Sul Mare, Italy (best student paper award). N. Zerrouki and D. Bouchaffra, "Pixel-based or Object-based: Which Approach is More Appropriate for Remote Sensing Image Classification? ", (Oral Presentation) in: Proceedings of the 2014 IEEE International Conference on Systems, Man and Cybernetics, (SMC), 05 October through 08 October 2014, Paradise Point Resort and Spa, San Diego, California, USA. H. Ykhlef and D. Bouchaffra, "Coalitional Game-based Adaboost" (Oral Presentation) in: Proceedings of the 2014 IEEE International Conference on Systems, Man and Cybernetics, (SMC), 05 October through 08 October 2014, Paradise Point Resort and Spa, San Diego, California, USA. A. Touazi, F. Mokdad and D. Bouchaffra, "Feature Selection Scheme Based on Zero-Sum two Players Game", in: The Proceedings of The 22nd IEEE International Conference on Pattern Recognition (ICPR), August 24-28, Stockholm, Sweden 2014. Youcef Brik, Nabil Zerrouki and Djamel Bouchaffra, "Combining Pixel and Object-based Approaches for Multispectral Image Classification using Dempster-Shafer Theory", in: 2013 International Conference on Signal-Image Technology & Internet-Based Systems, Terrsa Conference Center Kyoto, Japan. Djamel Bouchaffra and Jun Tan, "Subjective Labeling using a Pyramidal Representation", in: The Proceedings of The 16th International Conference on Industrial & Engineering Applications of Artificial Intelligence and Expert Systems (IEA/AIE-2003), Loughborough, UK, June 23-26, 2003. Djamel Bouchaffra and Jun Tan, "Structural HMM Modeling and its Applications in Automotive Industry", in: The 5th International Conference on Enterprise Information Systems, Angers - France 23-26, April 2003. Djamel Bouchaffra, and Jun Tan, "Mapping Designs to User Perceptions using a Structural HMM: Application to Kansei-Engineering", in: IEEE International Conference on Computational Intelligence for Modelling, Control and Automation - CIMCA'2003 (chaired by Lotfi Zadeh and Stephen Grossberg), 12-14 February 2003, Vienna - Austria. 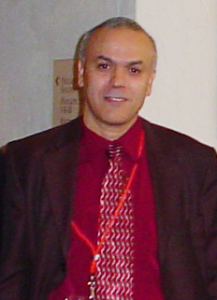 AH Zaied, Mohamed Zohdy, Djamel Bouchaffra, "Fuzzy System Inference for Automated Surface Finishing Process", in: Six International Conference on Design and Production Engineering, Cairo, Egypt, 2002 (PDF). Sawsan Aboul-Hassan and Djamel Bouchaffra, "Automotive Design Driven by Pattern Recognition", in: Smart Engineering System Design, Annie'2001 Conference Proceedings, University of Missouri-Rolla, November 4-7, 2001 (nominated for the best paper award). Lina Shoshani and Djamel Bouchaffra, "Identification of Handwritten Digits Using K-Nearest Neighbor", in: Proceedings of the Second IEEE Electro-Information Technology Conference, Oakland University June 7-9, 2001. D. Bouchaffra, G. Lallich-Boidin and J. Rouault, "Champs de Markov et Espaces Métriques dans la Recherche d'Information", in: Proceedings of the ALLCACH, 18-22 avril 1994, Sorbonne, Paris (France). D. Bouchaffra, G. Lallich-Boidin and J. Rouault, "Echantillonage Stratifié avec Restimation (Bootstrap): Application à l'Analyse Morphologique", in: Proceedings of the Secondes Journées internationales d'Analyse Statistique de Données Textuelles, Montpellier (France), 21-22 octobre 1993. D. Bouchaffra and J. Rouault, "Different Ways of Capturing the Observations in a Nonstationary Hidden Markov Model: Application to part of speech tagging", in: Proceedings of the Fourth International Workshop on Artificial Intelligence and Statistics, Fort-Lauderdale, Florida USA, Jan. 4-7, 1993. D. Bouchaffra, "Consistent Regions in Probabilistic Logic when using Different Norms", in: Proceedings of the Third International Workshop on Artificial Intelligence and Statistics, Fort Lauderdale, Florida, USA, Jan. 2-5, 1991. D. Bouchaffra, "A Relation between Isometries and the Relative Consistency Concept in Probabilistic Logic", in: 13th IMACS world Congress on Computation and Applied Mathematics, Trinity college, Dublin, Ireland, july 22-26, 1991. Bouchaffra, "Teaching: An Art But A Mutual Challenge", Published in the Oakland University Newsletter, March 2005.